Manufacturing the Marcellus: New, Cutting-Edge Rig Unveiled in Southeastern Pa.
Pittsburgh, Pa. – Last week, West Chester-based Marcellus Shale Coalition (MSC) member company Schramm, Inc. formally unveiled its new, cutting-edge T500XD Telemast drill rig. This made-in-Pennsylvania “walking, talking” and easily-movable rig is yet another example of how safe, job-creating natural gas production is Powering an American Renaissance. This rig sets a new standard with full 360 degree walking portability for fast moves from hole to hole without the traditional limits of two axis pad mounted designs. The T500XD also talks by offering full communication interface connectivity to third party data acquisition providers that utilize the internet or dedicated satellite communications systems to remote operation centers in multiple locations. Specifically designed for horizontal and directional drilling to a total depth of 15,000 ft. or more, the Schramm T500XD can precisely control weight on bit without relying on drill collars and gross string weight alone. It offers best in class 35,000 ft-lbs of top head torque, third party directional steering interface and 80,000 lbs. 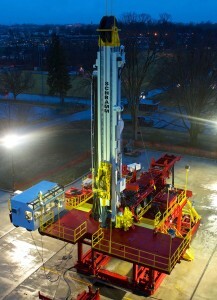 of hydraulic pulldown capacity to take full advantage of expanding shale play opportunities worldwide. Extending Schramm’s leadership role in pipe handling automation, this rig includes an integral LoadSafe XD system that can handle 24 inch diameter Range III tubulars weighing up to 10,000 lbs. Drill pipe is racked in the horizontal position for easy loading and offloading, dramatically improving operator safety. Click HERE to view additional photos of the rig. Indeed, Schramm’s new rig further underscores the fact that American manufacturing is coming roaring back thanks to safe natural gas development. And as President Obama laid out in his State of the Union Address, “Our first priority is making America a magnet for new jobs and manufacturing.” To learn more, visit Schramm’s website; and click HERE to read about other MSC member company supply chain success stories.